With her intent to take her artistic side beyond the haunts of Hanover College, the Indiana-based Associate Professor of Art Leticio Bajuyo finds solace in creating artworks out of discarded stuff. Being an avid DIYer, Leticio knows exactly how green art could offer or suggest feasible analytical environmental solutions to earthly problems. 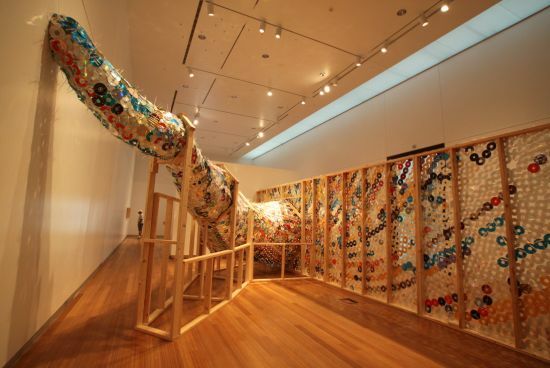 Just recently, she came up with sculptural installations, which she created using 8,000 discarded and donated CD’s. Leticio further utilizes cable ties and hula-hoops to revivify the discarded stuff. Sweet Station notes that installations that she finally produces are site-specific artworks which bestow a different meaning to the site where they are installed.